The first challenge was finding the place. The signage around HK, whether it be for a hiking trail or for the MTR is horrible. After mistakenly walking around an Ancestral Home (graveyard for ashes) thinking I was in the right place, getting lost in a small village neighborhood, I decided to do the smart thing and ask for directions. Turns out the path leading to the temple was right around the corner from where I first started searching. As I was walking down the path I thought I would end up at the same kind of temple that you see all around Hong Kong. As I turned the corner I immediately knew I was wrong. 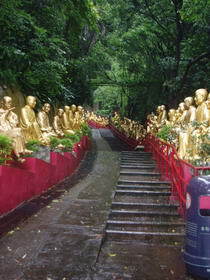 At the entrance of the temple, before the trek up 400 steps, are over 100 life size gold Buddha’s lining the path to the temple. What was remarkable is they were all different from each other. Different poses, facial expressions, standing, sitting, holding things, etc. I even saw one that reminded me of myself at our going away party! 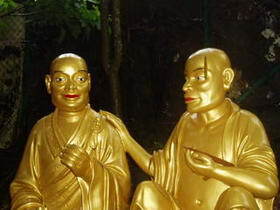 These Buddha’s lead all the way to the top of the stairs to the main temple. Inside the temple are countless shelves climbing 3 stories holding the 10,000 Buddha’s that are about 6” tall. What is the most interesting fact is that, like their gold buddies outside, they are all different from each other. 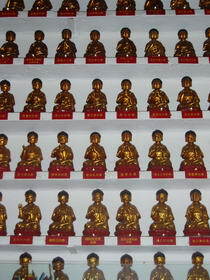 I also found out that there are actually over 13,000 of these small statues in the temple. 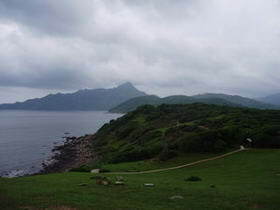 Tap Mun is a very small island also known as Grass Island. As I walked to the back side of the island I came across breath taking views of the South China Sea and grass covered cliffs leading to the surf below. Other then the few village owners I saw when I first got off the ferry I only saw 4 other people on back side of the island. That was a little scary knowing there are no other people around, especially as I am being approached by a Chinese man. Oh wait, he’s just a friendly policeman! The path that winds around the island ended up going through a graveyard that overlooked the ocean. In Chinese culture, this is the best place for someone to be buried. Getting back to the pier, I look at the ferry schedule and realize I have a 3 hour wait ahead of me until the next ferry comes. Long story short, I ended up taking a different ferry back to the mainland then a bus, then another bus then a subway then a bus. And I like not having a car because of why??? I started the day thinking I would be home by 2pm with time to go swimming. No... I got home at 7pm! Long day, but a good day! This is really cool. I hope you get to take me there sometime!